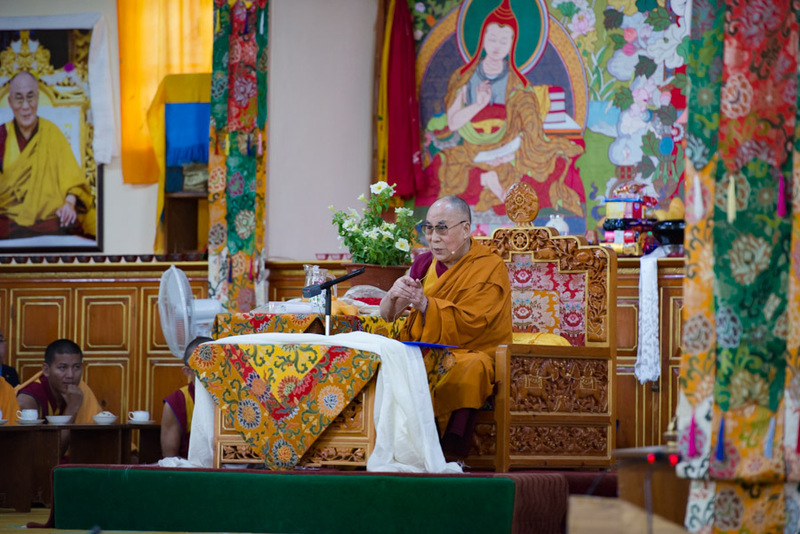 (TibetanReview.net, Apr27, 2016) – Tibet’s exiled spiritual leader, the Dalai Lama, on Apr 26 attended the graduation ceremony of the College for Higher Tibetan Studies (CHTS) at Sarah, near Dharamshala. Degrees were awarded to those who had successfully completed their Rimey Geshe, BA and MA degrees in Buddhism and Tibetan. The Kalon (Minister) for Religion & Culture of the Central Tibetan Administration (CTA), Mr Pema Chinjor presented Rimey Geshe degrees to 14 successful candidates, although two could not attend the ceremony. And the CTA’s Education Kalon Mr Ngodup Tsering presented BA degrees in Tibetan Studies to 28 graduates, including two who had completed it by correspondence course. He also presented MA degrees in Tibetan History and Tibetan Literature to seven and six successful candidates respectively. The CHTS was founded by Geshe Lobsang Gyatso, the late director of the Institute of Buddhist Dialectics, in 1991 and offers undergraduate course in Tibetan Studies and graduate courses in Tibetan History and Tibetan Literature as well as an effective teacher training programme. It currently has more than 300 students.